This soup came about on a clean out the pantry and fridge night. I used a can of peas and a can of corn (I know - gasp! ), along with the end of a bag of julienne carrots. But really, any frozen or fresh veggies will work here. Throw in some ribbons of greens, some snow peas cut on the bias, or some beautiful carrot coins. Switch up the herbs, or use only one kind. For the fish, I had a few fillets of tilapia and a large swai fillet that I took out of the freezer the day before, and in those went. Mild white fish is definitely the way to go here, it paired perfectly with the broth made slightly creamy from the addition of coconut milk. You may notice the obvious crazy yellow color of my broth. That comes from the addition of turmeric in my homemade curry powder. I've been adding turmeric to as many dishes as I can lately, since it aids in digestion, helps reduce the accumulation of toxins in your gut, and has anti-inflammatory properties (plus a whole lot more). Plus, it's bright and sunny, and just makes me happy. Check out more recipes using this superfood in my 100 Turmeric Recipes roundup! Oh, and I mentioned this came together quickly, right? You can have a pot of delicious soup on the table in under 30 minutes. What are you waiting for!? If you're looking for more quick and healthy seafood options, you should check out this Blackened Tilapia w/ Quick Collard Greens recipe, this Salmon and Cucumber "Noodle" Salad, and this Salmon BLT (one of my favorites). 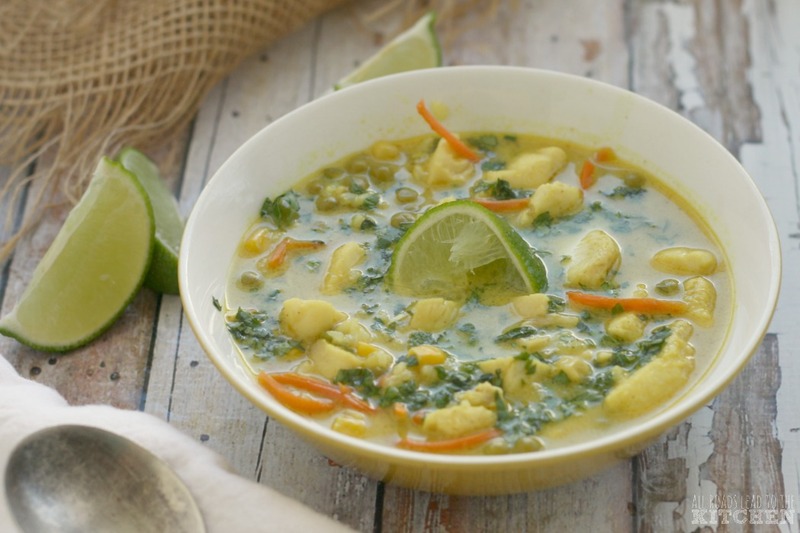 And if you're looking for more healthy soup options, check out the options listed below the recipe from the other Saturday Soup Swappers! 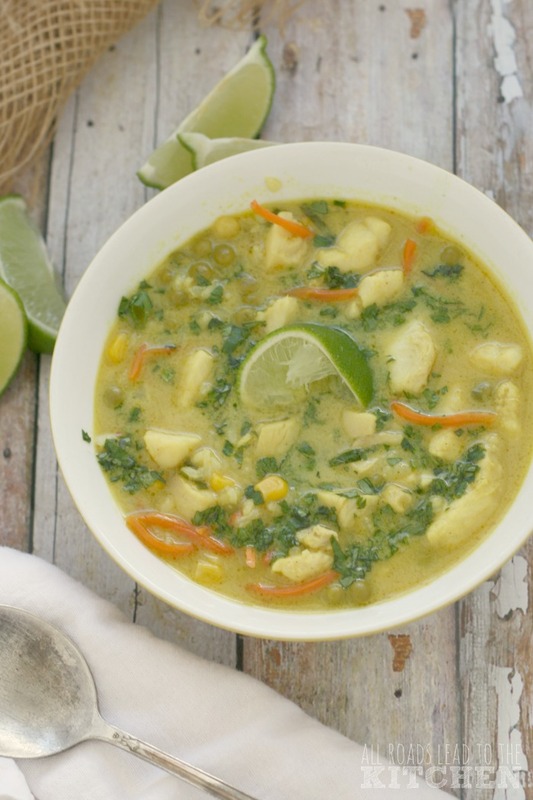 This brothy soup enriched with coconut milk is packed with chunks of tender white fish, veggies and herbs. Switch up the add-ins to match the season! Heat oil in a medium saucepot over medium heat. Add green onions, garlic, curry powder and sugar; cooking, stirring constantly for 2 minutes. Add chicken broth, coconut milk, ginger and salt. Bring to a boil, then reduce to a gentle simmer for 10 minutes. Add the fish and veggies to the pot, simmer until everything is cooked through, 3-5 minutes. Stir in rice and cook for 1 minute longer. Remove from heat and stir in herbs. 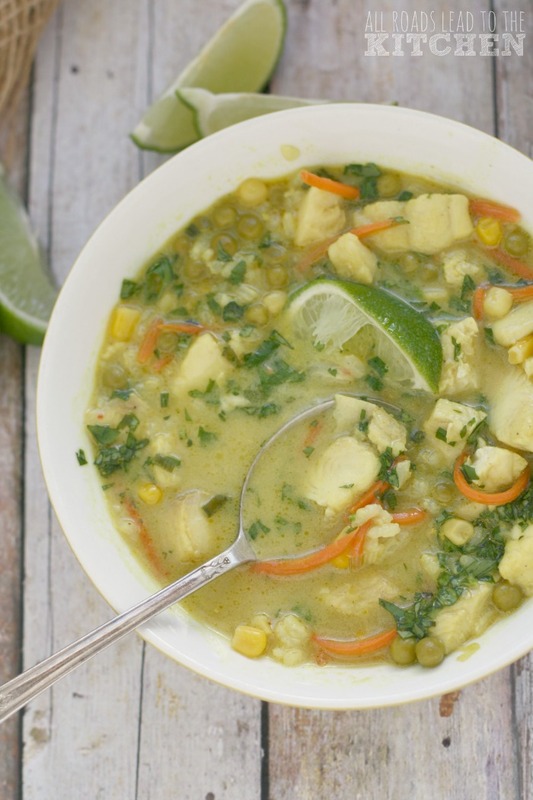 Serve with lime wedges for squeezing over each serving, to taste. ©All Roads Lead to the Kitchen. Adapted from Family Circle Magazine, January 2014.